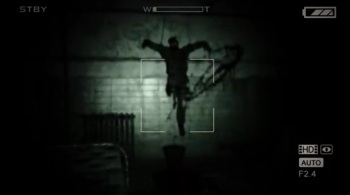 The makers of the indie horror game Outlast have enlisted the aid of scientists to make the game even scarier. Being startled and being scared are not the same thing. In gamer terms, it's the difference between some hellspawned jerk jumping out of a monster closet in Quake 4 and being hunkered down in the corner of Alexander's pitch-black basement in Amnesia, trying not to look at the mutilated thing shuffling around just feet away and staying very, very still. And quiet. Don't let him hear you. Don't move. Don't breathe. I don't have the expertise to explain how fear works, but Dr. Maral Tajerian does, and she's loaning that expertise to Outlast developer Red Barrels. Tajerian, a postdoctoral fellow at McGill University's Department of Neurology and Neurosurgery, is also a member of Thwacke! Consulting, "a multidisciplinary think-tank of academics that aims to bridge the gap between videogames and science in order to make their fiction creative, relevant, and immersive." The group's goal is to bring science literacy to the world of entertainment and "nurture intelligence in the gaming audience around the world," and apparently one way to do that is to help game developers scare people stupid. Thwacke is providing Red Barrels with insights and research on real-world criminally insane asylum patients, and also on historical asylum layouts and techniques, including the "often-questionable research" carried out on patients. By keeping the game as grounded in reality as possible, the team hopes to make it believable, and thus even more frightening. "The survival horror genre has seen many changes over the years, but the core is always a cerebral experience that capitalizes on anxiety and startles the player," Tajerian explained. "Due to the background of certain patients in the Outlast asylum, there are a lot of interesting behaviors that could be unsettling to a player. We believe there is tremendous space to help Red Barrels get creative beyond portraying asylum patients as thugs." I'm not sure if this really qualifies as "good" in the strictest sense, but I suppose that if horror is what you want, then a properly horrific horror game is what you should get. Red Barrels also announced that we're finally about to get our first real look at the game, as the studio will be showing it off later this month at PAX East. In the meantime, you can find out more about the PC-exclusive Outlast at Red Barrels Games.